“Uganda remains the main transit point and facilitator for arms and ammunition to the regime,” former U.S. diplomat Payton Knopf reported in September. The constant flow of weapons into South Sudan has been devastating for the country. Not only have the weapons enabled President Kiir to maintain his military operations against his rivals, thereby perpetuating the war, but government forces have repeatedly used the weapons against civilians. “The continued influx of arms has had a devastating impact on civilians and on the overall security situation in the country,” the U.N. Panel of Experts reported in 2016. The war began in December 2013 when Kiir launched military operations against forces loyal to his former vice president, Riek Machar. Since the start of fighting, the country has devolved into periods of horrific violence, pushing parts of the country into famine in early 2017. Currently, about two million people are internally displaced and more than 2.5 million are living as refugees in neighboring countries. About 4.4 million people, or about half the population, remain severely food insecure. For many years, the United States has been one of the main players in South Sudan. The Bush administration played an instrumental role in the diplomacy that culminated with South Sudan’s independence from Sudan in 2011. 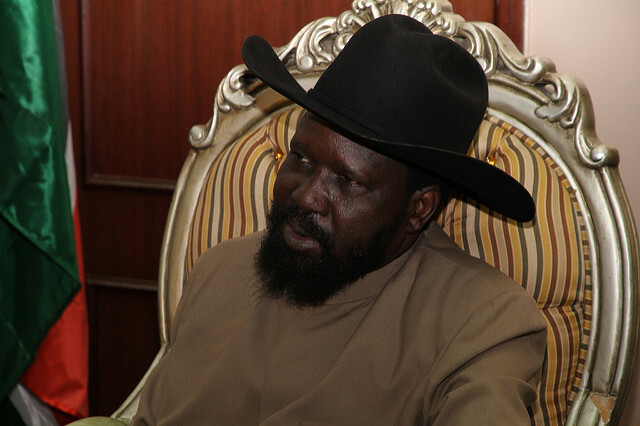 President Kiir likes to wear the cowboy hat that he received as a gift from George W. Bush. Once South Sudan gained its independence, the Obama administration oversaw a major effort to create a formal South Sudanese military. Before the outbreak of the civil war, the U.S. government had been providing the South Sudanese government with $40-60 million in military assistance every year. Although the Obama administration began withholding military assistance during the civil war, it remained centrally involved in the country’s affairs, siding with President Kiir in the war. Perhaps most significant, the Obama administration spent years opposing calls for an arms embargo, making it easier for the Ugandan government to channel weapons to the Kiir regime. “Despite what seemed like strong international consensus favoring an embargo, for several years the United States withheld support, and an embargo was not put on the UN Security Council agenda,” former Obama administration official Jon Temin acknowledged in a recent report. In the absence of an arms embargo, the Ugandan government spent several years moving weapons and ammunition into South Sudan. Reports indicate that the Ugandan government agreed to purchase arms for the Kiir regime and transfer them into the country. Some of the more advanced equipment that the Kiir regime received through Uganda include a military jet from the United States, a surveillance aircraft from Austria, and attack helicopters from Ukraine. According to a report by the U.N. Panel of Experts, the Kiir regime has used the attack helicopters as part of “a consistent tactical pattern” in military operations. Having gained such significant military advantages, President Kiir continuously sought a military victory over his rivals, setting aside repeated calls for diplomacy. In early 2017, the U.N. Panel of Experts identified the Kiir regime as “the main belligerent in the war,” blaming it for escalating the war, obstructing humanitarian assistance, and placing millions at risk of famine. President Kiir leads “a brutal regime that continues to murder and plunder its people,” former U.S. diplomat Payton Knopf told Congress. The Trump administration, which entered office at the start of 2017, initially paid little attention to the war. Although violence was peaking and the country was cracking apart, President Trump displayed little awareness of the situation, showing no understanding of the history of U.S. involvement in the country. Over the past year, however, the Trump administration has shown more willingness to address the war. After dispatching Ambassador Nikki Haley to tour the country and meet with President Kiir in October 2017, the administration moved to place an arms embargo on the country. With the backing of the Trump administration, the UN Security Council voted in July to impose an arms embargo on South Sudan for nearly a year. It remains to be seen whether the Trump administration is serious about the embargo. Just after the Security Council approved the embargo, U.S. diplomat Gordon Buay spoke out against it, arguing that the embargo “will not stop South Sudan from acquiring weapons.” Buay pointed to China and Russia as possible spoilers. Another major factor is the Trump administration’s plans for Uganda, the main transit route for arms into South Sudan. Now that President Kiir and former Vice President Machar are moving to implement a peace deal, it remains possible that the Trump administration will undermine the prospects for peace by permitting the Ugandan government to continue funneling weapons to the Kiir regime. A recent report by Conflict Armament Research shows that the Ugandan government has spent years circumventing an EU embargo on South Sudan with little to no repercussions. Evidence indicates that Uganda “has continued to be a conduit” for arms flowing into South Sudan, the organization reported. The South Sudanese government may already be circumventing the more recent UN embargo on South Sudan. According to the latest report of the UN Panel of Experts, there have been “a number of violations of the embargo,” including the possibility of arms being moved covertly through seaports and airports.